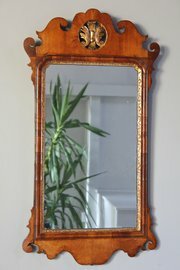 18th Century Walnut Wall Mirror. 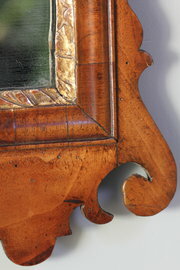 DescriptionAn 18th century wall mirror in the Chippendale style. 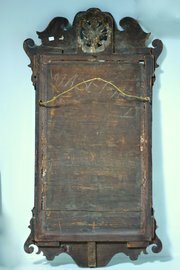 The walnut frame is cross-grained and moulded, and has a scrolled carved pediment and base. The pediment is decorated with a central carved and gilded fleur-de-lis motif. The inner slip is gessoed and gilded. The mirror is in good condition, having a natural waxed honey coloured surface. The top ear scrolls have been restored over the years, and the lily motif is missing the tip of the central frond. The mirror glass is not original but old and without many blemishes. Circa 1770.